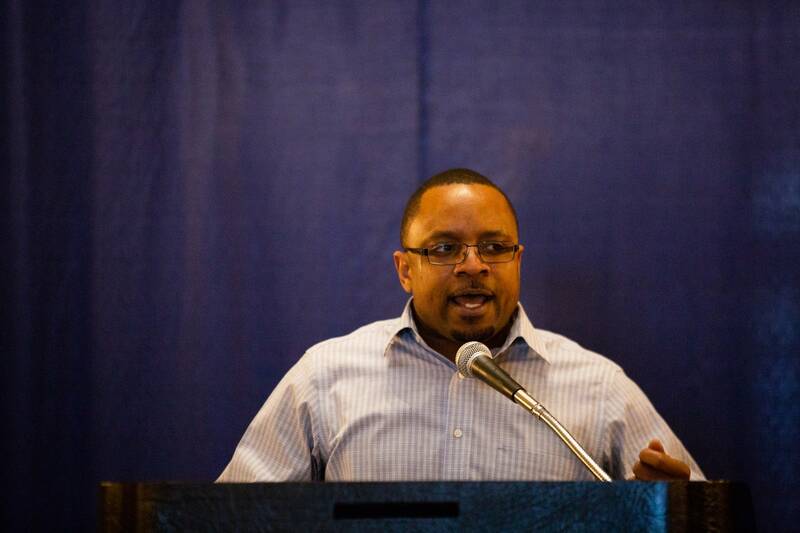 Terencio Safford first started his job search eight years ago. The 28-year-old had just gotten out of Stillwater prison after serving a sentence for a domestic violence conviction. In Minnesota, more than a third of inmates return to jail for new crimes within three years of release. Safford knew it wouldn't be easy to succeed. He told MPR News reporter Sasha Aslanian in 2011 that his criminal history kept coming up at job interviews. Safford also sensed his friends in prison were watching closely to see if he'd make it. "I wouldn't call it pressure, but there's a level of expectation and people are trusting me with new ideas — and that's what helps drive me," he said. Safford now has a college degree, a salaried job in information technology with a Fortune 500 company and serves on the board of a nonprofit that advocates for the rights of people who've been convicted of crimes. Safford admits he needed more than a few opportunities to succeed. His path was neither easy nor straight. Safford grew up in foster care in Alabama. He recalls a painful, lonely childhood. "Really troubled past, never met my father, he ODed on drugs. I was in foster care because my mother was addicted to drugs," he said. Safford remembers being told while in high school that he probably wouldn't make it. After moving to Minnesota as an adult, Safford racked up an extensive list of criminal convictions ranging from drunk driving to burglary and domestic assault. By the time he was sent to Stillwater prison, he knew he wanted to change. He got involved with a group called Amicus, which helps former offenders transition after they leave prison. "A lot of guys, they get out and they want to change their life, they just kind of go dormant," Safford said. "These guys don't continue to go after their dreams ... and that's something I wanted to do different when I left." After a promising start, Safford was arrested in 2013 for driving under the influence. He spent six months in jail before a judge allowed him to go to treatment in lieu of a prison sentence. He went to a year-long alcohol treatment program at Minnesota Adult and Teen Challenge. He was assigned to pick up trash every day in Teen Challenge's office. It was there that he met Tim Walsh, a vice president. "Every day we would talk about his faith, his recovery, his ambitions for his life," Walsh said. "He made the most of that five or ten minutes that he was in my office." Walsh noticed right away Safford's sensitivity to injustice and willingness to critique systems he didn't believe were working. He isn't surprised that Safford slipped after being released from prison. "Addiction often is a chronic course and oftentimes it involves relapse and multiple treatment attempts — that's just the way it is," Walsh said. "That's often how long it takes for people to change and be solidly in recovery." His problems were not just due to alcohol. Safford realized he was bottling up things from his childhood instead of dealing with them. Safford said Walsh helped him begin to move on. "I felt as if I was growing in maturity and understanding that you know where I'm at in my life is largely due to my actions," Safford said. "And if I was going to see my way out of it, I was going to have to really think about the choices I need to make." Safford left treatment without graduating, which violated the terms of his probation. He says Walsh spoke up for him with the judge, who allowed him to remain free because he was still in active recovery. Safford moved into a sober house and began the long process of getting his life together. His first steady job was working IT at an Office Depot. It was a step in the right direction toward his goal of working in cyber security. After more education and other jobs, Best Buy hired Safford last November to work in its corporate headquarters. When the issue of his criminal record has come up, he's faced it head on, and often been surprised at the opportunities people granted him. It took him about 10 years from his first days in Stillwater prison to a salaried job in his field. "I am still blown away by it. Ten years ago, this was like a dream," Safford said. "I never thought in my life that I would have made it here." Safford also has been trying to give back. 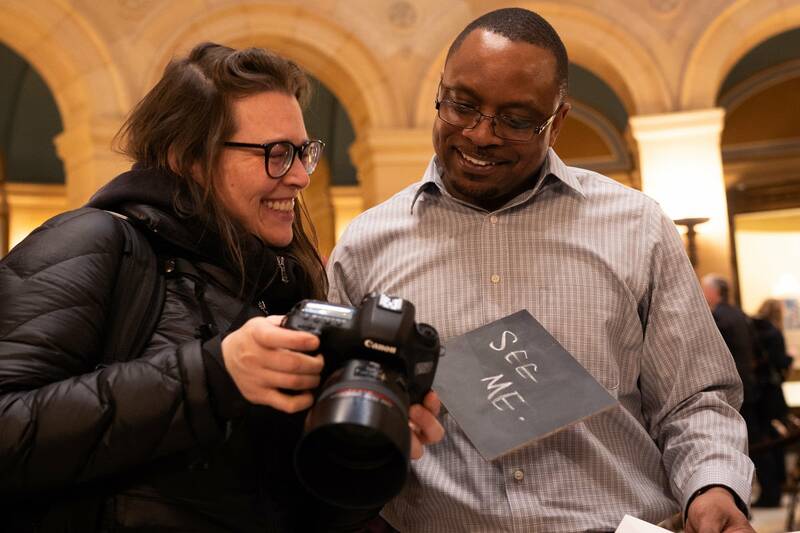 He serves on the board of Minnesota Second Chance Coalition, a nonprofit pushing a number of proposals this year, including the lowering of criminal and traffic fines and a reduction in felony probation periods. The coalition supports the restoration of voting rights for felons once they're on probation. "These policies, they do work. Some will tell you, 'It doesn't change these numbers or doesn't affect this group of people,'" Safford told a rally in the Minnesota Capitol rotunda. "But I'm here to tell you it will change lives, and if you can change lives, you will change the people." Although the bill to restore voting rights has some bipartisan support, its fate is uncertain. Senate Majority Leader Paul Gazelka, R-Nisswa, said he hasn't yet decided his stance on the legislation, but he's concerned it doesn't appear that restoring voting rights to former felons on probation would reduce recidivism. "What I'm contemplating is, rather than felon voting, maybe consider shortening some of the probationary periods of the sentence so they get to a place of mainstreaming into society a little bit easier," Gazelka said. In the state House, the proposal to expand voting rights for felons is authored by Rep. Raymond Dehn, DFL-Minneapolis, who also is a former felon. Dehn acknowledged that there aren't extensive studies about the connection between restoring voting rights and re-offending. "There's a lot of common understanding that when an individual participates in pro-civic and pro-social behavior that they have a different understanding of their role of the community, that they're less likely to recidivate," Dehn said. The proposal won't affect Safford since his probation has ended and he's eligible to vote. Walsh of Teen Challenge said he's proud to see Safford succeeding in his career and helping other former felons. He's even urging him to consider a run for elected office. Safford hopes the campaign to restore voting for felons on probation will inspire some to rethink what voting really means. "People need to be aware of how toxic our society has become, when it comes to disenfranchised citizens or people on probation and parole or people with felonies," Safford said. "The message that I want people to have is that compassion is where we need to be."